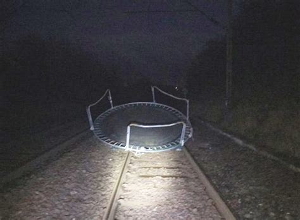 "Our staff have reported a trampoline on the line at Helmsdale. Our Traincrew are trying to remove this safely but help is on the way from our on-track staff." However, after a couple of seconds, the thought of comedy disappeared as I began to imagine the possible consequences of a train hitting a trampoline at speed. This picture, supplied by ScotRail, of a similar occurrence, shows why. As we head towards autumn, and begin to expect high winds, I would hope that anyone living near a railway line would give some thought to what is lying around in their garden. Many items - trampolines, gazebos, garden table parasols - are quite substantial yet have built-in 'sails' and can fly far on a high wind. Tell your friends!